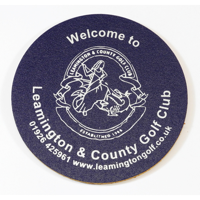 Fantastic range of printed promotional coasters spot colour or vibrant full colour options. Great for mailings, request a free sample today. There is a huge range of materials and subsequent finishes possible with coasters : manufactured from recycled vending cups, a rubber material called Gnalvic, hard acrylic coasters, screen-printed stiffened vinyl coasters, melamine coasters, bonded leather coasters, bespoke soft PVC coasters & anodised metal coasters - a look, feel, finish that suits your needs can definately be found. 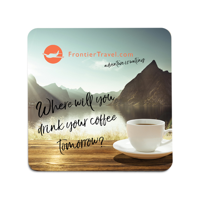 Promotional coasters can be screen or digitally printed, embossed and even be manufactured to a bespoke mould the possibilities really are endless! Coasters are a fantastic promotional product, everyday cups of tea or coffee are drunk and everyday that mug is lifted and put down onto someone's coaster. What if that coaster was YOUR coaster, seen out of the corner of your buyer's eye all day long? 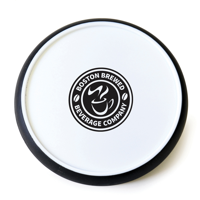 Given away at a trade show, left behind by a sales person or a great mailing item promotional coasters are a fantastic promotional product.